Justice League is clearly two things. First off, it’s blatantly the product of divergent directors. And secondly, it’s a clear course correction for the DC Cinematic Universe. You may have heard that Joss Whedon was overseeing reshoots this year. It coincided with original director, Zack Snyder, taking time off for personal reasons, so it didn’t seem that sinister to begin with. What is surprising, however, is just how much of the film feels like the result of said reshoots. The giveaway, of course, is first of all Henry Cavill’s weird CGI mouth (for those who don’t know, they had to digitally remove a moustache he was sporting for another film). But secondly, the banter, the generally hopeful tone and, above all, the abundance of comic book fun feels like a deliberate change after the mixed responses to Batman v Superman: Dawn of Justice and Man of Steel. The score features not only Danny Elfman’s Batman theme from the 1989 film, but John Williams’ Superman theme! Elfman himself is on scoring duties, and he combines these classics with the Hans Zimmer themes that dominated the DCCU so far. And that mish-mash is a good example of the mutated film that made it to screens. I don’t think this film does justice – ahem – to Jason Momoa’s Aquaman. We’ll have to wait until his solo entry before we see if his take on the character is going to succeed. Ray Fisher was the big surprise though. 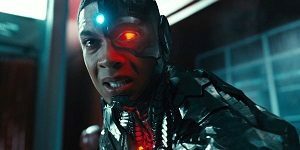 He’s excellent as Cyborg aka Victor Stone, and his digital (or digitally-enhanced) costume looks great in action – which is a relief after the awful posters. 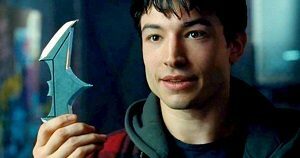 The same goes with The Flash/Barry Allen, and Ezra Miller provides some much-needed levity. But the film also manages to take itself seriously. Whedon is known for his punchlines and witty dialogue, but he never lets it get in the way of the drama. …which is bizarrely what I’ve been criticising Marvel about recently. So take all of this with a grain of salt. To lay my biases bare: I’m sick of Marvel’s safely middle-of-the-road output, undermining every dramatic beat with a joke, and I’ve always enjoyed DC comics more than Marvel ones. At the end of the day, Justice League is not the unmitigated triumph that Wonder Woman was. But nor is it the mess that was Suicide Squad. We may never know if Snyder’s original vision would have been a good film, but this is one of the best last-minute re-edits that I’ve seen. This entry was posted in Film Reviews and tagged Action/Adventure, Comedy, Comic Book, Fantasy, Science Fiction by Stuart Wilson. Bookmark the permalink.